Puerto del Carmen in Lanzarote is known as the place to go if you want to party until the early hours. The main ‘strip’ along the beachfront comes alive at night with bars and nightclubs that cater for all tastes. However, if you fancy are looking for a more relaxed evening the Old Town area that surrounds the marina is the perfect place to enjoy a chilled out evening meal. The Old Town has all the charm of a Spanish village with restaurants and bars tucked away down narrow streets. I visited Puerto del Carmen with a friend recently and we stayed close to the Old Town. 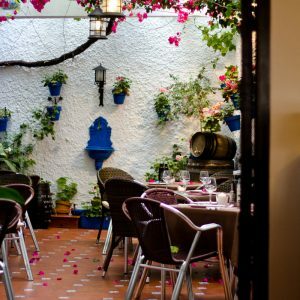 Whilst on our travels we discovered the ‘Restaurant La Cascada Puerto’, a fantastic restaurant designed to look and feel like a traditional Spanish farmhouse. The restaurant is also a bodega with wine cellars and the typical Iberian hams hanging from the bar as you walk in that really makes you feel like you are in some atmospheric bar in a tiny Spanish village. The whole dining experience in La Cascada Puerto is excellent. 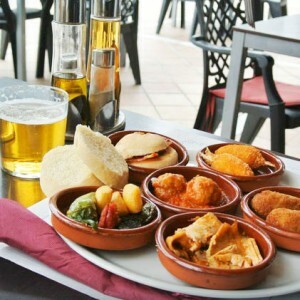 The food is delicious whether you choose to sample the delicious tapas or go for a larger main meal, it is top quality. The choice of wine is great and if you like a good bottle of Rioja you can’t go wrong here. Just as importantly the staff are friendly and always cheerful! The lighting is soft and relaxing but there is always lots going on so it is great for a romantic meal or dinner with friends. 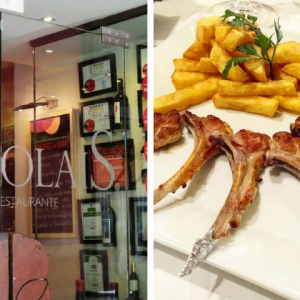 I dined at this restaurant 3 times in one week which is virtually unheard of when I’m on holiday but the menu is so extensive and the quality of the food so good we just didn’t want to go anywhere else! The weather as also pretty poor when we visited in February and the cosy atmosphere in the restaurant was just what we wanted. We were lucky enough to see an impromptu flamenco show on one of our visits and ended up dancing with locals to the Spanish guitar. It really felt more like being in Seville or Madrid than in Puerto del Carmen! If you are staying in Lanzarote and want a great meal in an ambient and relaxing setting (with the possibility of entertainment!) then I cannot recommend this place highly enough. This entry was posted in Canary Islands and tagged Food & Drink on March 19, 2013 by Jess Whittle.